For over a century, rotary equipment has been widely accepted as a preferred means for the pyro-processing of bulk solids, offering distinct advantages over stationary processing equipment. As a cylinder rotates, tumbling, sliding, lifting or showering continuously agitates the material within. These actions ensure that the material being processed is uniformly exposed to the heat source, ultimately leading to higher efficiencies and reduced processing times relative to a stationary process. From drying to calcining, and various exothermic and endothermic chemical reactions, rotary equipment has become the cornerstone of many industrial processes. This article will examine the similarities and differences between both indirect and direct rotary dryers and rotary kilns, as well as a look at choosing between them. While there is some overlap between rotary dryers and kilns, they are generally used to carry out distinctly different goals. The rotary dryer is a heat transfer device most commonly used for “low temperature” applications where the goal is to reduce the moisture content of the material. Conversely, rotary kilns are used for what are considered high temperature processing applications, where the goal is to cause a physical change or chemical reaction in the material. Both direct rotary dryers and rotary kilns rely on direct contact between the material and process gas in order to process materials. Because rotary dryers operate at low temperatures, it is not necessary to internally line the dryer shell, and as a result, a wide range of internals can be installed to improve heat transfer. The most common form of internals is a lifting flight or “lifter,” which is typically plate steel extending perpendicularly inward toward the cylinder center line. These lifters act to pick up material from the bed that forms as an arc on the upward running face of the cylinder’s inside surface. The cross sectional area of this material bed is typically about 10% of the overall cross sectional area. The direct-fired rotary dryer internals effectively act to remove material from this quasi- static bed of tumbling solids and lift it along the shell’s inside periphery and then shower or disperse a curtain of material as the internals approach the highest portion of rotation. The density of the showering curtain is of key consideration to the rotary dryer designer and operator. The efficiency and effectiveness of this equipment is determined in part by how much intimate contact exists between the solids and the hot gases flowing within the vessel. Please refer to Figure 1 below, which characterizes solids flow in a direct-fired rotary dryer. The rotary kiln is most typically a carbon steel cylinder lined internally with refractory. In a direct-fired kiln, the hot gases of combustion are in contact only with the refractory lining and product, thereby protecting the steel structure of the vessel from high temperature stresses. The result of this design is that products can be elevated to up to about 3000°F without causing damage to the rotating vessel. The operation of the higher temperature, refractory lined rotary kiln is very similar to that of the rotary dryer. The principal distinction is that a rotary kiln’s operation is not defined by showering material in the hot gas stream, rather, the arc of material that forms may intentionally remain intact and is not dispersed. Heat transfer to the solids is not typically dominated by convection. Hot gases continuously heat the internal refractory lining of the kiln shell and as the cylinder rotates, the tumbling bed of solids is constantly exposed to the hot refractory surface. Since the solids are in intimate contact with a hotter surface, heat transfer is by conduction. Radiation effects also occur, especially if the refractory is glowing at elevated temperatures above 1200°F. The surfaces of the solids bed (toward the kiln center line) also experience heat transfer by radiation since material is in “view” of the hot-glowing refractory. Direct convection also exists between the innermost surface of solids and the hot gases flowing over the bed. As in a rotary dryer, typical bed loading in kilns is about 10%. As one might expect, the direct-fired rotary dryer acting as a dispersion device can achieve higher heat transfer rates than refractory lined kilns. The result is that the rotary dryer can transfer more heat per unit volume than a rotary kiln. Although indirect-fired rotary kilns and dryers closely parallel the direct-fired rotary devices in operation, the indirectly fired kiln or dryer is distinct from its direct-fired counterpart, due to the fact that all heat transferred to the processed material is conducted (and/or radiated) through the vessel shell wall. In an indirect device, there is not an internal gas flow acting as a heat source, so components such as lifting flights would offer no perceivable advantage. Heat is transferred to the bed of solids by conduction between the solids and the conduction between the solids and the hot, internal wall of the kiln. In most applications, the shell is heated to temperatures at or above 1200°F, so radiation between shell and solids also prevails. Since products of combustion are completely isolated from the product being processed, two heat transfer mechanisms take place. Heat is transferred to the rotating shell’s outer surface by an isolated heat source, most commonly; gas or oil fired burners orientated so as to “bathe” the shell surface in hot products of combustion. Depending on size and geometry of a particular unit, a number of burners forming an array may be employed to avoid localized overheating of the shell through excessive localized heat release. Other heat sources may be employed such as electric resistance heating elements or hot waste gas or thermal transfer fluid from isolated sources. In the event that gas or oil fired burners are used, the products of combustion are emitted through a stack as clean flue gas. 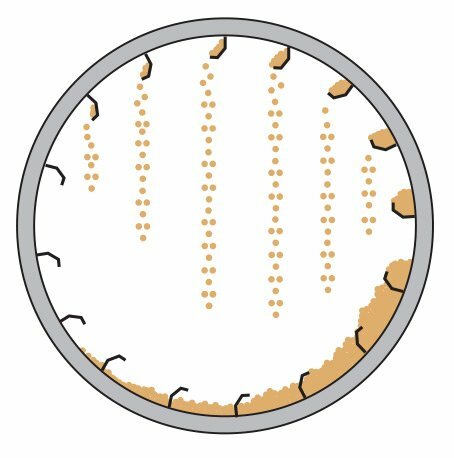 In an indirect-fired rotary kiln, the shell temperature tends to be uniform along the circumference regardless of the heat source being from a distinct point. This is no doubt due to the excellent conductivity of the alloys of construction. Once the shell attains operating temperatures, heat will flow radially inward through the shell wall to the interior face. The second heat transfer mode is that of transferring heat from the internal shell surface to the colder bed of solids. The heat transfer process is best modeled as a heat flux passing through a boundary layer (the shell). Please refer to Figure 2 below, indicating typical arrangement of an indirect-fired rotary dryer or rotary kiln. In the case of gas burners being the heat source, the washing of the shell is dominant since it employs radiative and convective modes. The heat transfer from the shell interior surface to solids being processed is, therefore, the controlling condition. Heating the total feed to 212°F where moisture evaporates readily. Recall that there is to be no carrier gas to dilute the partial pressure of the water evolved. Heating dry solids to temperature at which the organics vaporize. Heating solids to reaction temperature. It becomes critical to view such an overall process as distinct steps since each occurs at a fixed temperature range. As one might realize, such fixed temperatures allow the system designer to more accurately determine the log mean temperature difference, which is a governing variable in the overall design equation. Direct vs. Indirect Rotary Kilns & Rotary Dryers: What Makes Sense for Your Application? Virtually any process that can be carried out in a directly fired rotary kiln or dryer can also be carried out in an indirectly heated unit. Both types of systems have inherent advantages and disadvantages attributed to their operation. As a general rule, direct-fired devices are more efficient in operation and also have a lower capital cost than their indirect counterparts. For this reason, direct-fired units are significantly more common than indirect-fired units. There are numerous applications however, in which an indirect unit offers better overall economics. While the indirect process was conceived of and used over 100 years ago, only in the last 25 years have indirect rotary vessels become a widespread commercial reality. This is due primarily to advances in materials of construction capable of withstanding higher temperatures. As a result, indirectly heated dryers and kilns continue to gain attention for both improving existing processes as well as developing new ones. Throughout many industries, indirect-fired units are employed in process settings that call for more specialized processing needs. Common settings where indirect units provide a better processing medium are listed here. Indirect-fired rotary kilns can be beneficial when the material to be processed consists of finely divided solids. In a direct-fired rotary kiln, the heat source is hot gas (products of combustion and air) which flows with an inherent velocity. These gases can carry discrete particles through from drag. The degree of entrainment depends on a variety of factors such as gas velocity, gas density, particle density, and shape. 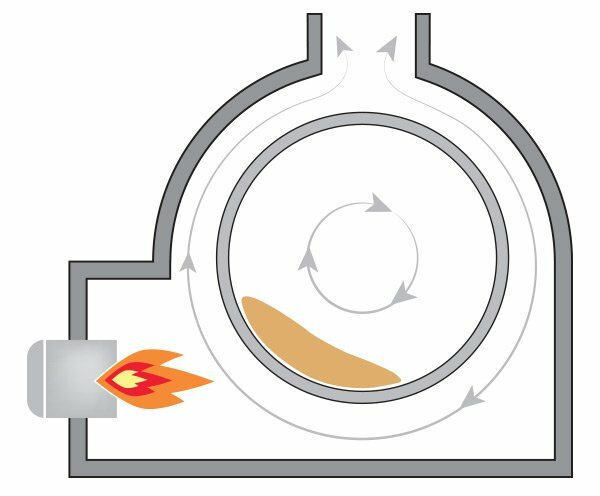 Due to entrainment potential, direct-fired rotary kilns processing fine materials require the design to be centered around permissible gas velocities as opposed to heat transfer requirements. Indirect-fired rotary kilns do not rely on processed materials being in intimate contact with hot combustion gases. 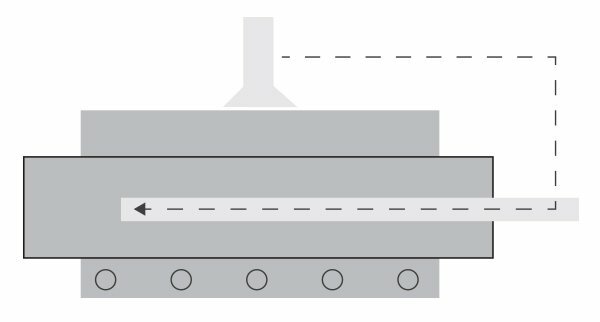 It is common for direct-fired rotary kilns to have upward of 100 times the mass or volume of process gas flowing within the vessel as opposed to an indirect unit of the same duty. Some examples of fine materials commonly processed using indirect-fired rotary kilns are Carbon Black, chemical precipitates, filter cakes, and finely ground solids, etc. Another setting in which an indirectly heated unit will outperform a direct one is when processing must occur in an inert environment. As an example, most carbonaceous solids will combust at elevated temperatures in the presence of free oxygen. High temperature processing of combustible products such as coal, petroleum coke, sludge, and numerous organic solids can be carried out in direct-fired rotary equipment, but careful provisions must be made to ensure safety. Fuel rich or near precise stoichiometric flames must be developed to reduce the presence of free oxygen. Such systems are complicated in their control and may involve oxygen detection, explosion relief doors, and automated extinguishing systems. 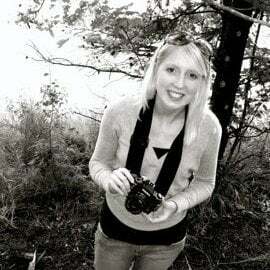 Such extensive provisions involve added costs and careful licensing and insurance detail. Other applications exist in which oxidation of product does not pose an explosion or combustion risk, but the quality of the product may be deleteriously affected by oxidation. Applications where an undesirable oxide compound forms in the presence of oxygen at high temperatures are often best performed by indirectly heated means. A common example would be a metallic product. Other isolated cases may exist where a solid may form an undesirable compound with nitrogen at high temperatures. In such a case, it is nearly impossible to eliminate nitrogen composition from processed solids in a direct-fired rotary kiln, but relatively easy in an indirect-fired rotary kiln. Indirect-fired units are also used to perform an array of gas to solids reactions. The indirect unit can prove ideal to expose solids to a gaseous chemical reactant under high temperatures where reactions occur at accelerated rates. The “doping” of ceramic catalysts could serve as a practical example. Such chemical reactants can be introduced into a direct-fired unit, but the reactant becomes diluted by the hot gases, which are required, as a heat transfer medium. In indirect units, any reactant utilized can be piped in and metered to achieve precise concentrations. The goal of some processes is to recover a high value volatile component from a somewhat valueless solid carrier. As an example, consider the thermal separation of oil from oil shale. Such an application is likely best suited in an indirect-fired unit. As in the case of combustible materials, a direct-fired vessel could be carefully designed to perform the separation, but the load on separation equipment, such as a condenser, becomes greatly increased by undesired tramp air. The cost associated with these ancillary separation devices can far exceed the cost of the heat transfer vessel itself. By processing such a material in an indirect-fired unit, the desired volatile product is highly concentrated and does not burden the recovery equipment with needless tramp air. Another highly promising application is in using an indirect-fired rotary kiln to effectively distill valuable oils from low value wastes such as scrap tires, oil saturated soils, and oil drilling wastes (cuttings). There is an array of applications in which a hazardous component may be adsorbed on an inert solid substrate. An example of this is spent activated carbons, used to adsorb an undesirable waste component from a liquid or gaseous stream. In such cases, the “spent,” or used up carbon can be activated for reuse through means of an indirect-fired rotary kiln. The used up carbon can be held at high temperatures and the adsorbed component will volatilize and effectively be desorbed from the carbon, making the carbon again ready to absorb a hazardous component. Following desorption, the volatilized waste is evacuated from the system via an imposed draft. This off-gas from the indirect-fired rotary kiln would be laden with a hazardous waste component that could then be either condensed in high purity, or incinerated as a concentrated vapor stream. This operation of reactivating a solid substrate could be performed in a direct-fired rotary kiln, but the off-gas burden would be significantly increased. Depending on the regulations placed on the volatilized compounds, the treatment of this off-gas could be quite costly. Chemical laden soils; absorbents, tank wastes and other inert substrates follow the above conditions very closely. All of the previous applications for indirect-fired rotary kilns are just some of the many instances in which an indirect rotary kiln can be advantageous. As these examples indicate, there are countless applications wherein an indirect-fired rotary kiln may result in a more cost effective system overall. The developer of a pyro-processing application must take into account the cost of all required ancillaries, operating costs, product quality requirements, and several other variables as opposed to merely the cost of the primary heat transfer device. 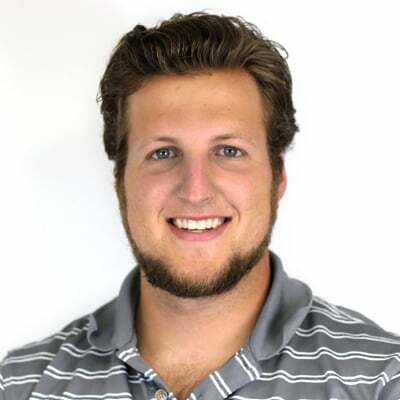 When evaluating an overall system approach, the designer must also take into account operating cost factors such as the cost of fuel, cooling water, power, instrument air, the air quality restrictions, and the cost of off-spec product. Recent developments have been made to develop equipment flowsheets that combine direct and indirect processing steps. Some hybrid equipment has been developed with direct and indirect phases occurring in a single vessel. As an example of this, consider the ducting of clean flue gas from the furnace segment of an indirect unit to a direct rotary dryer. This scenario can be achieved in a single vessel. Please refer to Figure 3 below. In this device, hot flue gas dries moist spent carbon very effectively in an initial pre-drying section and since the carbon contains high moisture levels, burning of carbon does not occur. Rotary kilns and dryers have become the foundation of many of today’s industrial processes, offering distinct advantages over stationary equipment. And while direct-fired units have been the predominant configuration, recent advancements in heat-resistant alloys have opened the door to more specialized processing applications using indirect-fired vessels. When choosing a rotary kiln or dryer, it may be desirable to contact suppliers of both types of technology to compare the attributes of either approach. 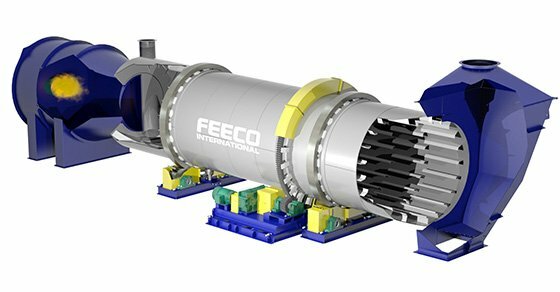 FEECO has been providing custom rotary dryers and kilns since 1951. We’re familiar with hundreds of materials and can help to develop a process and commercial-scale unit around your unique material and processing goals. For more information, contact us today!